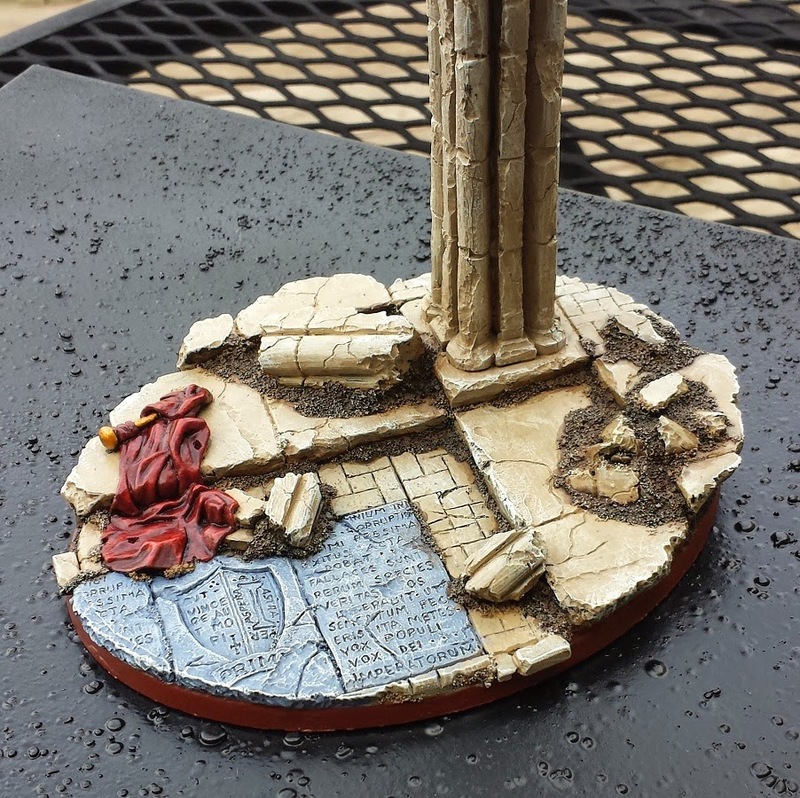 While I was working on the test models, I'd done a test base using the flying stand from the set of resin bases I'd ordered from Fantascape to get a feel for what I had planned would actually look. I wasn't super happy with the grey slate from the test bases, and thought I'd go with a sandstone color instead, but still include a bit of the slate as a spot color on the inscribed areas sculpted into the bases. I wasn't super happy with the marbled grey slate from the testers, and thought I'd go with a sandstone color primarily, and include a bit of the slate as a spot color on the inscribed areas sculpted into the bases. Add a bit of dark brown dirt in the recesses and we're good to go! 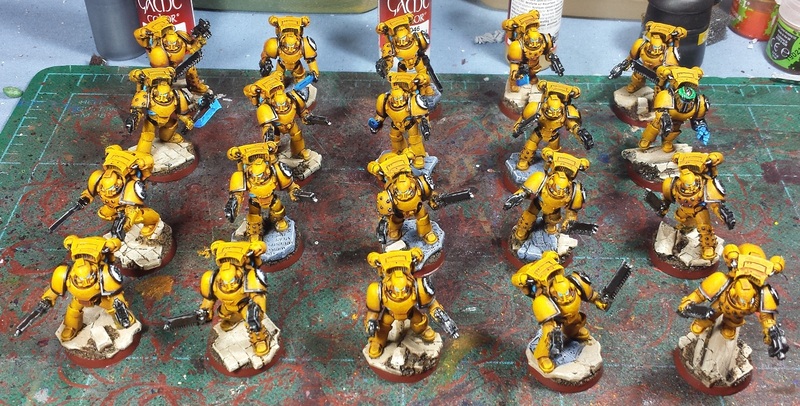 I'm nearing the initial painting stage on the assault marines - still have a few colors to go but wanted to get the bases painted to see how it sets off against the yellow of the models. Reasonably well I think! I'm finding it's good to snap pics in various stages, as it helps point out steps that I've missed - totally forgot to wash and highlight any of the eye lenses. Gotta fix that in tomorrow's painting session! I'm trying to decide on what to do on the right shoulder pads. It appears that in most of the color plates in the FW books the heresy-era Imperial Fists tended to bear the fist on both pads, with a single example that I was able to find wherein they bear the "VII" legion numbering - that's what these folks will get. Looks like I'm going to have to order a whole mess more sculpted pads from FW for the next couple units. Here's where not building the whole army at once comes in handy! Cool stuff. The sand colour is a bit too light for the colour scheme in my opinion but overall they look great. The grey stone does blend it better. At this point would you be willing to paint the brown rim a tanned colour (maybe like snakebite leather) to match the sandstone? Man you should paint for the NOFC next year! I bet you could crank out a whole army all by yourself!!!! I think with the armour being a bright colour, that the sand is not looking quite right to me. The previous grey bases contrasted better. Damn those are looking good! Give us some closer shots of the fists on the bases! I think the sandstone would work with some glazes to break up the tones some. Fantastic! You really do have a skill for cranking these out and providing a great look. I personally like the sandstone and slate combination, but to Greg's point maybe a light glaze to set them off just a bit. I like the glazing idea for tonal variance in the bases, and to help set the yellow off even more. That said, you're a friggin beast, man. Though I have to admit that a 'Fists army surprised me! I love that flyer base -- for some reason, that fallen piece of cloth really does it for me. 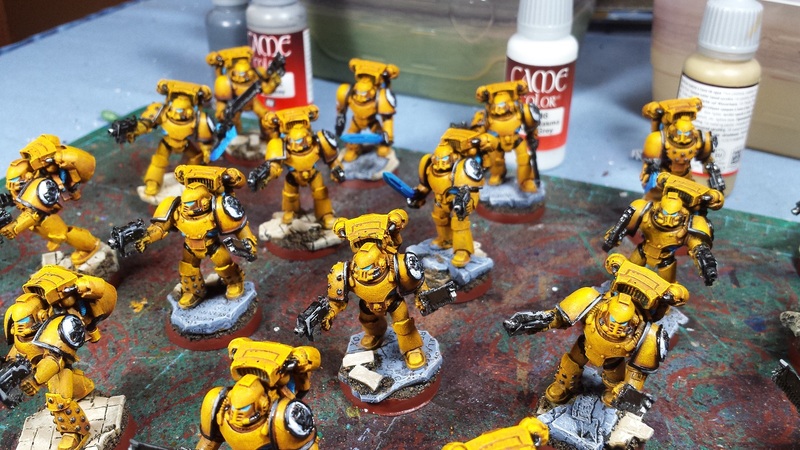 As for your Imperial Fists, they are looking great so far! 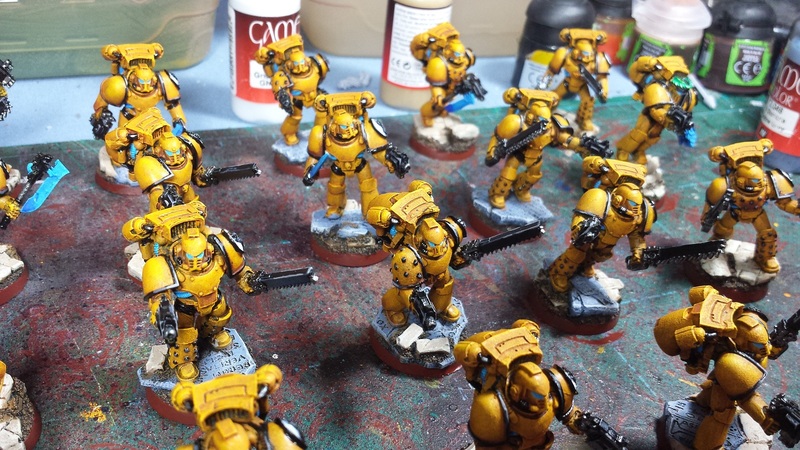 That yellow is really lush and makes them pop in the best possible way. If I have one small gripe, it's that I think you could take a little more time painting those eye lenses: You don't need to go for a complete jewel effect or anything, but right now, they are looking too solid and uniformly light blue for my taste. But your pace is impressive, as always, and this is just a minor quibble on an otherwise excellent project -- as always, keep up the amazing work! @TheAmbit: Thanks man! I think you're right, they're a little light now that I see 'em contrasted against the yellow. @Zab: Hah! I'd be up for that! @Da Masta Cheef: Thanks very much! @Greg Hess: Will do - there are several more steps to go, some close-ups will be inbound as they near completion. @Joe B: Thanks man! Aye, I think a further wash may give them a little more depth and contrast against the yellow. @Miniature Tim: You got it, man. The Fists were a bit of a left field project, but I'm having a lot of fun with the scheme so far. Yellow is a challenge and it's been interesting to push my skill a little bit with that color! @KrautScientist: Aye, I realized I missed the lenses when I took these pics, they will be getting a little wash and a white specular dot to help 'em pop. I do the same thing with my base edges. For everything!! And I do so for the same reason you do hahaha. Are you going to add some grass tufts to the base? I think that would look swell. @Catachan Commissar: Good man! Aye, I'm thinking they'll get the occasional tuft on the bases that have a lot of dirt showing. These are beautiful. Yellow is tough to work with!